THE WOODLANDS, Texas (seminoles.com) – Junior Morgane Metraux is tied for first place in the individual standings, and the No. 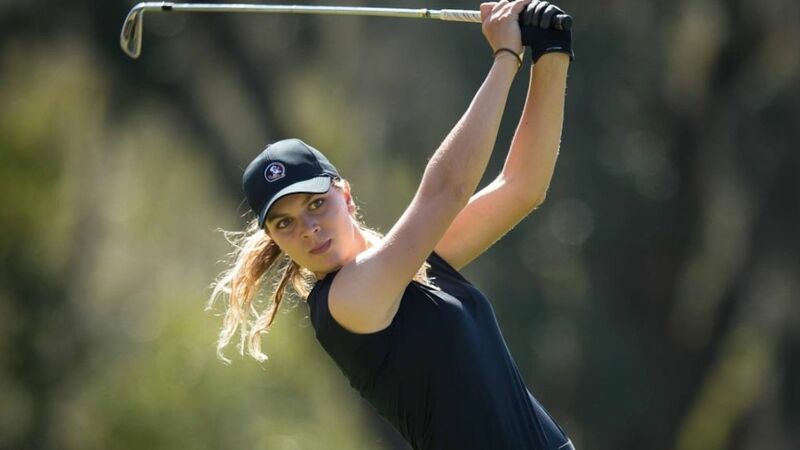 3 Florida State women’s golf team is in first place in the team standings after two rounds of The Dickson on The Tournament Course at The Woodlands Country Club. Metraux carded scores of 69-66 for a 135 two-round total and the Seminoles have a 15 stroke lead over SMU with the third and final round of the event coming on Tuesday. Florida State, which won the Florida State Match-Up in its last outing, is looking to win its fifth tournament of the year which would tie the single-season school record set by the Seminoles 1980-81 team. That team, coached by Florida State Hall of Famer Verlyn Giles, won the A.I.A.W. national championship in 1981. It certainly showed for Bond’s bunch in the first and second rounds as the Seminoles shot a 275 (-13) in the first round and a 279 (-9) in the second round as the 16 teams in the event played 36 holes on the first day of the tournament. Florida State shot a two-round total of 554 – for an amazing 22-under par total. The five Seminoles playing in the event combined for six of eight rounds under par with scores of 66 in the first round by freshman Amanda Doherty and in the second round by Morgane Metraux. Morgane Metraux (Lausanne, Switzerland) carded scores of 69 and 66 for a two round total of 135. She is in a tie for first place with Maddie Szeryk of Texas A&M. Metraux is looking to win her second consecutive individual championship and the third of her career. She won the individual title at the Florida State Match-Up on February 12. Metraux carded a 69 in the first round with four birdies and 17 holes played at par or better. She tied her career low with a 66 in the first round as she converted six birdies and the eighth eagle of her Florida State career. She eagled her first hole of the second round and was five under par with five birdies on her back nine. Metraux closed the second round with four birdies on her final five holes. She totaled 10 birdies and only three holes scored above par in her 36 holes played on Monday as she tied her career best 36-hole score at 135. Doherty (Atlanta, Ga.) played the best golf of her young Florida State career and she totaled scores of 66 and 75 for a 36-hole total of 141. Her score of 66 in the first round ranks as her career best and marks the third time in her six-match Seminole career that she has carded a score in the 60’s. She is in a tie for seventh in the individual standings with a two-round total of 141. Senior Lydia Gumm (Radcliff, Ky.) continued her stellar senior season as she finished the first day of play in a tie for 12th place in the individual standings. She carded scores of 74-68 for a 36-hole total of 142. Gumm came within one stroke of tying her career-best single round score of 67 which she achieved in the second round of the Florida State Match-Up. Senior Matilda Castren (Espoo, Finland) is tied with Gumm and two others for 12thas she carded scores of 70-72. She totaled eight birdies in the two rounds she played on Monday. Junior Kim Metraux (Lausanne, Switzerland) is in a tie for 16thplace in in the individual standings with scores of 70-73 and a two-round total of 143. Florida State will play with SMU and Kent State beginning on hole No. 1 at 8:00 a.m. central time.